The design team at Henschel-Steinau, Inc. selected a combination of Sintra Material and metal for fabricating the POP display. Black Sintra Material of 4mm was cut, routed and screen printed with images of soccer players in action; the material was drilled and connected to the metal frames. 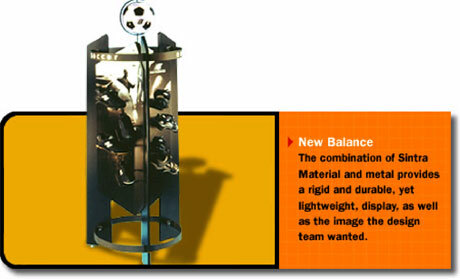 As an attention-getting device atop each display, a soceer ball was attached. The combination of Sintra Material and metal provides a rigid and durable, yet lightweight, display—as well as the image the design team wanted, according to Mann. “Our business is the design and engineering of POP displays,” he added. “We work with a variety of materials including corrugated paper, plastics, metal and others, but Sintra Material had the properties we needed for this display.” The company employs approximately 60, including creative people, engineers, project managers, sales and support staff. Available in a wide range of thicknesses and colors, Sintra Material is a rigid board of moderately expanded plastic.